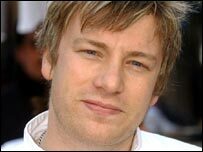 Junior doctors are calling on celebrity chef Jamie Oliver to repeat his success with school dinners and lead a campaign to improve food in hospitals. During their annual conference in London, delegates approved a motion calling on the British Medical Association (BMA) to ask him for help. Junior Doctors Committee chairman Dr Simon Eccles warned poor hospital food was slowing patients' recoveries. The Department of Health said progress on increasing standards was being made. Dr Eleanor Draeger, a junior doctor from London, had urged delegates to back her call for reform. 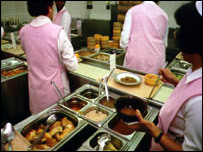 Stop blaming the "hospital" and start blaming the cooks - after all, it's their fault the food tastes so bad! She said: "Food and nutrition is absolutely vital for the health of our patients." Dr Draeger admitted being sceptical of Oliver's idea, but praised the "brilliant" results and said patients deserved the same benefits. The call to bring in Oliver came five years after former Masterchef host Loyd Grossman led an initiative to improve hospital menus. But Dr Eccles told the BBC News website an anecdotal survey of 100 junior doctors showed none reported seeing any changes in the food served in their hospital. He said: "That hasn't seemed to make any difference to the food. "What doctors are served in the evenings is pretty awful - and the food the patients get served is substantially worse. We often see relatives bringing in food for patients." The Department of Health says £500m is spent on hospital food in England each year, with the NHS providing 300 million meals - working out at £1.67 per meal. 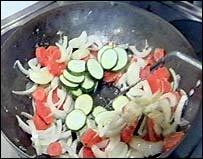 Dr Eccles added: "In one hospital I worked in, the evening meal would be a sandwich, an apple and orange juice. "If it was a beef sandwich, there would be two slices of beef and nothing else; no butter and no salad." He said patients recovering from illness or surgery needed more than the normal daily intake of 2,000 calories. But patients get an average of 1,000 calories a day, he said. The government promised extra funding for school meals after a high profile campaign led by Oliver. A spokesman for the chef said: "We hope that when the School Dinners Campaign establishes itself in the rest of the country, the government will then take a look at how the initiative has had a major impact, as this could easily be duplicated for hospitals." A Department of Health spokeswoman said: "We provide around 300 million meals each year which makes it one of the largest catering operations in the world. "Having seen improvements in the quality and availability of food, there is a need to really tackle the issue of under-nourishment and its impact on clinical status." Another department spokesman said: "Work needs to be done but progress is being made to improve standards." But he said it was "wrong" to say the Grossman initiative had "failed" to improve standards as hospitals were offering more good food. The BMA conference is also looking at whether patient safety is compromised by moves to allow specially-trained nurses to carry out certain procedures.